Where to start. Well, 18 months ago I found out I was pregnant, and two short months later I found out I was carrying fraternal twin girls. I grew them for 8 months and two weeks, and when they were born they became a bigger part of my life then I could have ever imagined. They are my heart, and life without them just wouldn’t be complete. Fast forward several months through weight loss, post partum depression, weight gain and I am constantly battling my body and how to accept it’s new form. I was never thin before, but I was not overweight. I dressed femininely in skirts and dresses that created the illusion of a waist on my straight figure. I have the opposite of a waist, now. My hips got a couple inches wider, my waist got wider than that even and now I look like I’ve wrapped a sack of potatoes around my midsection. I do not know who this body belongs to, but it certainly isn’t mine! When I was pregnant my old roommates told me I was a body builder! I felt so empowered by the end of my pregnancy, this was the biggest thing I have ever done in my life. I bore life. Two beautiful, perfect life’s. So why do I beat myself up? I feel lazy, and my eating habits are horrible ranging from not eating to binging on junk. How do new moms find the balance? I feel like I’m a great mom to my girls, but I don’t even come close to giving myself the same care and attention that I deserve or need. Before the girls were born, I was obsessed with bouncing back to my pre pregnancy shape and size. 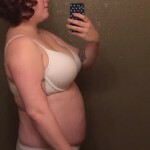 The girls came via scheduled cesarean, so I had plenty of time to mentally prepare and have no major issues with my scar or even stretch marks. I read that nursing would make the weight melt off, and then for multiple reasons was unable to nurse. I envy the lucky women who bounced right back. I believe I was about 12 weeks pregnant [in the first picture], so a pretty decent idea of how my body looked before. 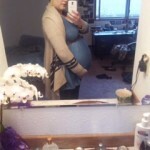 Probably at around 34 weeks [in the second picture]. 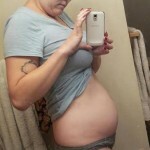 I got much bigger doing most of my growing in the third trimester, when I got all my stretch marks. Sad. Now my bra size is 40DDD and I look like a nice lumpy pillow. I took this almost 9 months PP. I’m depressed now. A “body builder”. That’s an awesome way to look at it, I love that term. Growing those twins is a pretty huge accomplishment. You ask “how do new moms find the balance?”. Trust that it’s hard. It’s so easy to say that it’s important to make time for ourselves, but when a little baby is crying as you’re on your way out the door to “take care of yourself”, it’s just hard (and I hate when people say that’s “making an excuse”). And you have TWO babies. My children are getting older now (9, 13 and 15) and while stresses change, I do have more time to look after myself and you will too. But don’t beat yourself up over having less balance than you’d like. Babies throw the balance off. You are a bodybuilder, you are beautiful. Balance will come. body builder. brain builder. heart builder. love builder. soul bringer. your body has done and will continue to do amazing and beautiful things for you and your children. your love makes this a world i feel thankful to be part of. I hear, you I’m in almost the same boat – fraternal twin girls, born 18 months ago. It’s so hard to take care of yourself like you used to be able to do. Twins are all-consuming. I’m not an expert, but I think it’s probably pretty rare to “bounce back” after having twins. I’ve sort of come to hate the term “bounce back;” it feels symbolic to me of all of the crap we put ourselves through. I had a prolapse after the babies were born and I haven’t been exercising like I used to for fear of making it worse, and I managed to breastfeed so I haven’t been dieting as I don’t want it to affect my milk supply. Before they arrived I was very focussed on my weight and how I looked. I was always obsessing over food. Now it bothers me from time to time, but I’m trying to be kind, forgiving and generous to myself as much as possible. That’s what I wanted to say to you: your body has done a wonderful, amazing, difficult thing and you need time, space and love to heal. On a practical note, have you been checked/checked yourself for a diastasis? My stomach muscles had a four-finger wide gap between them right after the girls were born, which has now shrunk down to one finger wide. I’ve been doing Pilates with an instructor who has a lot of experience working with post-partum women. It’s important that you do the right exercises in the right way so as not to make it worse, but it can help a lot with core strength and bringing everything back together, which helps with your shape. Not to mention that long term it’s not great for your body to have separated stomach muscles; it can lead to back ache and other issues. I know it’s not easy to fit in stuff like that but I only go one evening a week and I feel like it’s made a big difference. Apart from anything else it’s really nice to have that time to do something just for myself. I have the same problem regarding food. I am lazy and I had the really bad habit of going to bed really hungry (for some reason it helps me sleep). I had all of these problems post partum with baby #1. And then like you said, I’d binge and then starve again. I started forcing myself to eat more meals during the day, and I feel better about myself. I honestly don’t have and body issues besides flappy sack breasts and a few stretch marks, but from what I can see, you look fine. If you feel that your weight is restricting you to be the mom you want to be, then try walking it off (that at least worked for me). Otherwise, all I know is my husband would love it if I kept on extra weight as you did. Your only 18 months postpartum, you have plenty of time. Good luck and I think your beautiful.